Theater actor Dominic Spillane has a confession. He finds public speaking terrifying. While acting allows him to hide behind a character, "When you're public speaking, it's you. You're open to insecurities and assumptions," Spillane pointed out. But when the actor stood in front of an audience of aspiring and veteran entrepreneurs last Thursday at the Vermont Center for Emerging Technologies in Burlington, he was in his element, eliciting chuckles as he shared how he once fell asleep while watching a show. Then Spillane offered a solution for avoiding dud shows and catching sleeper hits: TheaterEngine. Created by him and his dad, John Spillane, it's a social networking platform for the performing arts industry. 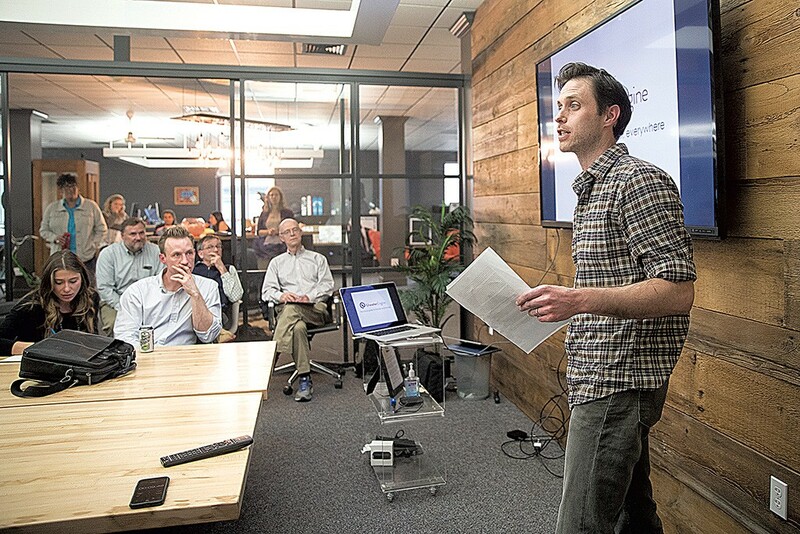 Spillane is one of the finalists in LaunchVT, an annual business pitch competition that matches startups with mentors and, ultimately, awards the top two companies cash prizes and in-kind support worth $115,000 in total. When the Lake Champlain Regional Chamber of Commerce in Burlington organized the first LaunchVT in 2012, its primary goal was to support young entrepreneurs in the Green Mountain State. Since then, entrepreneurs of all ages have competed in LaunchVT, and this year's event saw the highest participation of businesswomen, said Katie Taylor, director of workforce development and entrepreneurship at the chamber. "We always want a lot of female participants," she added. But "I don't think we've ever had couple teams" — until this year, when the finalists include an all-female group from Middlebury College and two married couples. It took the advisory board two weeks to pare down approximately 60 applications to the final seven, Taylor said. The other finalists are three teams affiliated with the University of Vermont. Each of the seven teams has been assigned at least one industry mentor to coach them in refining their business plan. Last week, they had a dry run in front of their fellow finalists, coaches and LaunchVT advisory board members to get feedback. Each of the contestants used a pitch deck — slides made with programs such as PowerPoint or Keynote — to present their idea. On Friday, May 12, the finalists will make their pitches to a panel of judges at Main Street Landing Performing Arts Center. "Generally, there are three criteria that we're going for," said Taylor. "Likelihood of success, scalability of the business and the ability to create jobs in Vermont." Here are profiles of the contestants, whose businesses cover territory ranging from formal wear to campgrounds to edible crickets. Recent college graduates often find themselves at loose ends. To remedy that aimlessness, UVM juniors Robbins and Silverman created an online platform that introduces students to potential projects and career opportunities, so they can get a taste of working in different industries, build experience and make money. Robbins and Silverman came out on top at the LaunchVT Collegiate competition in February. They've recently made their product, previously known as BeaconVT, available to private high schools, said Silverman. He said their LaunchVT mentor has given them not just a confidence boost but advice on financial projections and markets. "We're a new company, made by very young people," he said. "While we might have a lot of passion ... I'm a 21-year-old kid. I don't necessarily know how to price my model." Silverman reckons they've revised their pitch deck seven or eight times already, focusing on creating a strong narrative. "I'm competing against top players," Silverman noted. Tomorrow's Harvest is Vermont's first cricket farm for human consumption. "Crickets are going to be the most sustainable and most complete protein source out there," Stephen said. The couple have been busy, working on their presentation slides and meeting their mentor once a week. While the Swansons had approached their business from the perspectives of education and sustainability, their mentor has been giving them the financial angle. "He's been great, making sure that we think big," Stephen noted. As they fine-tune their pitch, Stephen said, the pair's biggest challenge is making sure they can stick to the eight-minute time limit. "There's definitely nerves involved," he confessed. But the Swansons are confident about their "very unique" business, which Stephen described as "completely sustainable." They tout crickets as an alternative food source for an era of climate change and factory farming. "[Tomorrow's Harvest] ensures that our kids have the kind of lives that we've enjoyed," said Stephen. TheaterEngine, whose domain went live a few weeks ago, is designed to offer theater professionals listings of current and upcoming shows, as well as a database of production history. 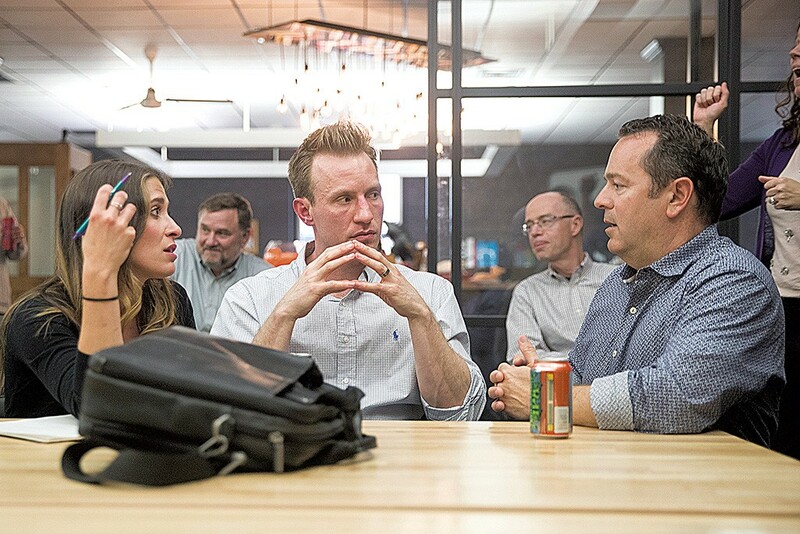 Working with his mentors has been "absolutely invaluable," because they have "a lot of experience crafting language around all kinds of business models," said Dominic. The best piece of advice he's received? "Stop trying to be what you think people want you to be, and be who you are." He had used "sterile and boring language" in previous versions of his pitch, Dominic admitted. While presenting statistics is important, his mentors have encouraged him to turn the pitch into a narrative. In the days running up to May 12, Dominic will be "practicing, practicing, practicing, practicing, practicing, practicing that pitch." He's also looking to print business cards and spruce up his presentation. "Everybody's slides look so good," he said. Shaw and Reider-Smith describe Share to Wear as a solution to the college woman's clothing crisis: a platform that allows clients to lend and rent dresses. One woman's moneymaking opportunity is another woman's money-saving opportunity. Their pop-up shop in Middlebury has about 600 dresses. "It's really been cool to see Share to Wear become a community on campus," Shaw said. The full team of six Middlebury students took second place in the LaunchVT Collegiate competition. This time, the team will be out to prove it has a business model with a revenue stream that includes more than rental fees. Shaw said she has learned to balance the group's social mission — breaking down socioeconomic barriers to high-end fashion — with economic viability. For the past couple of weeks, she has been driving to Burlington to meet with her mentor and film herself practicing her pitch. "I don't hate giving presentations. I feel confident," Shaw said. On May 12, engineer McDevitt will be focused on one thing: telling the story of his propulsion system, which moves the smallest satellites around in space. "While winning would be nice," McDevitt said, "this is our chance to get our message to the Vermont community." The satellites that GreenScale powers can provide internet to the world or take pictures for Google Earth. McDevitt said they're "going to be a big part of the next wave of the space industry." McDevitt worked with a graphic designer to create a visually appealing pitch deck. In the run-up to the finals, he plans to practice his pitch in front of different audiences. "My poor wife, I've been pitching at her every single day," McDevitt said with a chuckle. The trick, he said, is to make the material accessible to a wide cross-section of people: "You want to have that sweet spot. "I'm confident in my ability to get my story out," he concluded. "But when you get a timer, you don't want to leave out something important." This husband-and-wife team from Quechee is avid about camping. About 18 months ago, sitting around a campfire, the pair came up with a business plan for a platform that makes it possible for campground owners to create their own mobile apps. Since launching their product last November, they've been traveling to publicize their platform at conferences for owners of RV parks and campgrounds. Sometimes enthusiastic attendees take over their table and market the platform on their behalf, Heather said. In addition to running a business, the Geres have spent a lot of time on their pitch deck, developing a story line and creating PowerPoint presentations. The feedback they received during the dry run has them strategizing about more effective ways to present their financial projections and business model. The solution, Heather said, is "not to talk so much about the features [of the platform], but the problems that we're solving." This team, consisting of three UVM electrical engineering professors and chief engineer Andrew Giroux, is developing a platform to coordinate "distributed energy resources" found in household items and small businesses. The aim is to keep costs low and balance supply and demand in the grid. "The electricity business can be a little bit overcomplicated," Hines said. The team's main challenge is to explain its product in a way an average audience can understand. The team meets with its mentor once a week, Hines said, often for a couple of hours. The mentor has been particularly valuable in helping to refine the business model and economic projections. "We learn that, again, we need to clarify the advantages of our technology," Hines noted. "I think being well prepared is the best strategy for dealing with nervousness," Hines offered. He'll be the one doing the presentation, because "transition between team members can be confusing." And he calls it a "real privilege" to be a part of LaunchVT. The original print version of this article was headlined "Pitch Perfect"